Modern architecture is about clean lines, spare design, minimal decoration, geometric forms. But more than that it’s about interpreting our homes and their design in new ways. Ask a small child to draw a house, and you’ll like get a square box with a triangle roof. What if you take that basic geometric structure and manipulate it in new ways? Stretch this wall out here. Turn that roof there. Remove this wall and make it a big window instead. 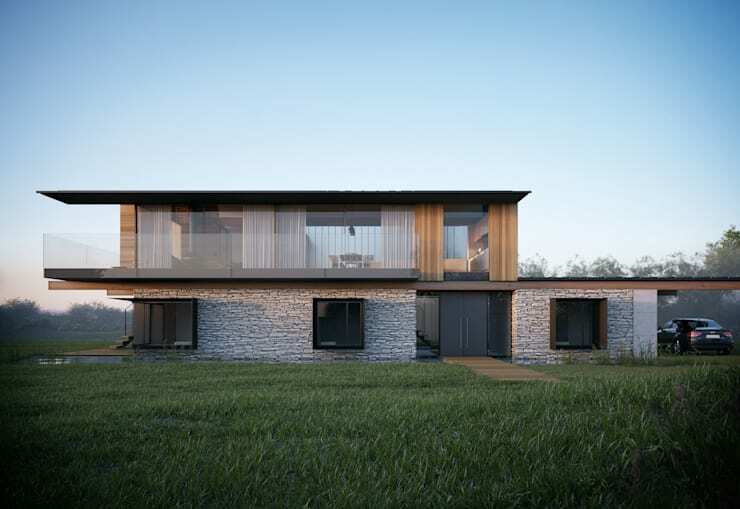 The result might be something like this home in Wales designed by Hyde + Hyde Architects and photographed by Metro Cubico Digital. An example of what is possible when a creative architect reimagines what a home can be. The exterior of this home is a beautiful example of how to blend traditional materials—stone, wood—with more modern ones—glass and metal. The monochromatic grey stones clad the lower level, creating a sturdy base for the rest of the structure. Rather than using stones in regular rectangular shapes, the architects chose irregular shaped stones. The result is a more natural, organic feel. 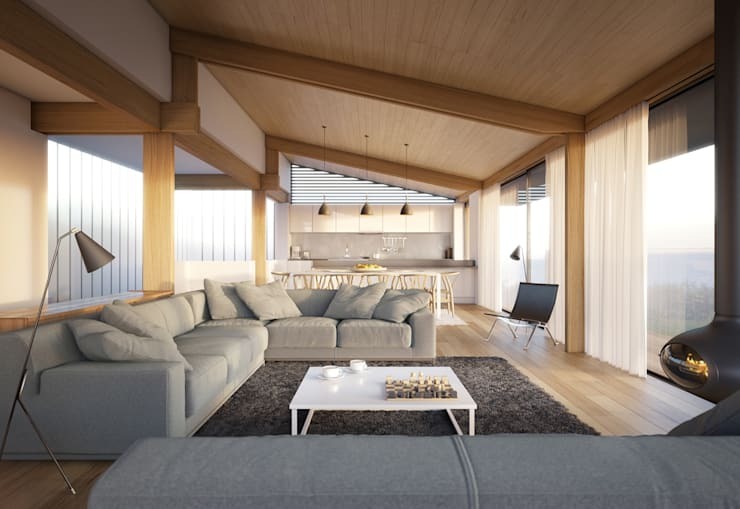 Wood accents in the beams that support the upper storey, small sections of siding and the eaves of the generous second floor deck are an additional natural reference. Glass and metal, two favourite materials of modern design, play a starring role in the dramatic second storey. In place of traditional walls, the architects used glass floor to ceiling and nearly corner to corner. The metal roofs are the defining feature of the home. The architects used the peaked roof from our childhood house drawing—but just one half of it. They then inserted a central corridor that cuts through the middle of the house from foundation to roof. On the other half of the house, they turned the roof 90 degrees and lessened the pitch. Despite the distinct design in each half of the house, the overall presentation is unified by materials and balanced by proportions. Viewed on an angle, the home’s dramatic structure is even more obvious. The second storey cantilevers over the stone base. The soaring roof, wide overhang and wrap-around deck increase even further to the upper floor’s size. However, the house doesn’t feel overly top heavy thanks to the use of glass on the upper storey, which makes it appear light and almost transparent. This is countered by the weight of the stone used in the lower storey. Around the foundation, large windows project out from the walls—except for in one corner where a recessed patio provides access to a placid pool. Butting a pool right up to the house is a very unusual design, but it is an example of how these architects reinterpreted conventional elements in new ways. Around the pool, the emphasis is on seamless transition. The wood deck and lawn are nearly level with the water. With no barrier between the house and the pool, they appear to all be part of the same structure. Inside the house is all about barrier-free living as well. 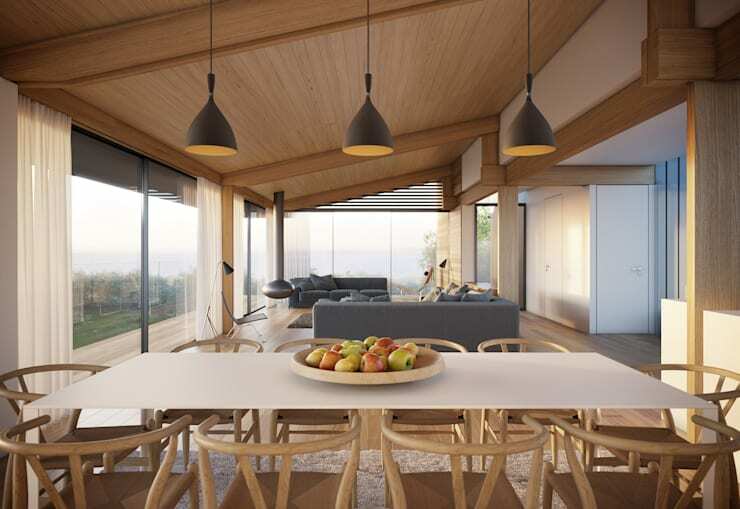 The living, dining and kitchen areas all occupy one open space. Your eye flows from one end of the house to the other. The upholstered sectional in the living room eschews tufting or rolled arms for a simple rectangular form. However, its plush cushions show that no sacrifices have been made on comfort. The metal chair, three-legged floor lamps and white coffee table are quintessentially modern. When it comes to creating a comfortable, cozy environment, nothing beats a fireplace. But once again, the designers put a modern spin on this traditional feature. The black orb fireplace suspended from the ceiling is a decidedly futuristic design. Moving into the dining room, we see how the architects both unified and divided these main living areas. 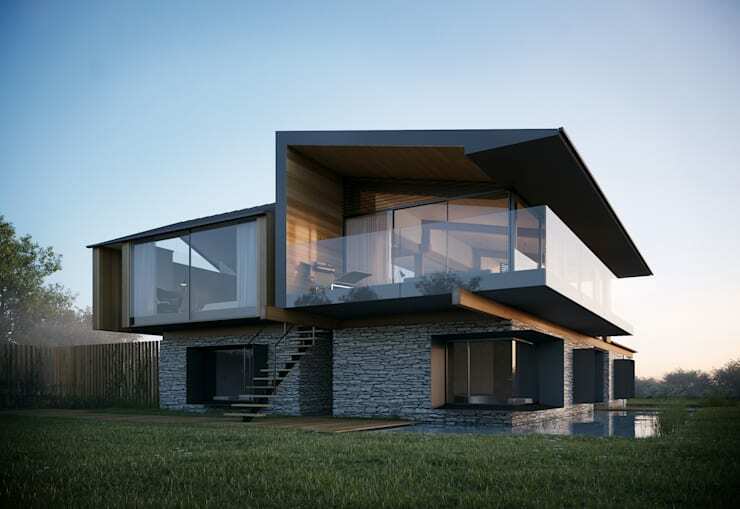 The walls of glass span the whole perimeter of the house, offering stunning views of the Bristol Channel. Barely there sheer curtains are available to filter the light as needed. 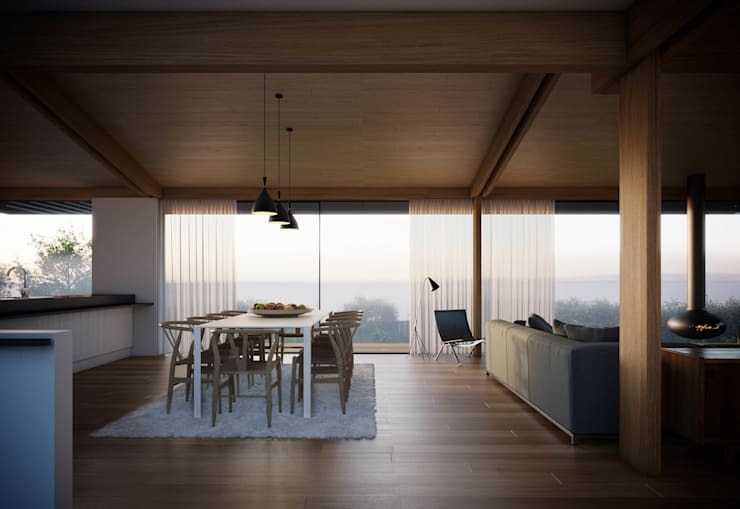 The wood ceiling and floors flow through the entire space providing visual continuity. However, careful placement of beams and posts helps to subtly divide the kitchen from the dining area from the living room. As well, a fluffy rug under the dining room table helps to ground the eating area. Stepping fully into the dining room, we see the power of simplicity in design. A clean-lined white table and trio of putty toned pendant lights work harmoniously with the wood wishbone dining chairs. These chairs, designed by Hans J. Wegner in 1949 for Carl Hansen & Søn, are modern furniture icons. The vault of the ceiling follows the peak of the roof that we saw outside. The angle adds drama and visual interest to the space. As with the outside, though, the architects inserted a central corridor. Here the lower ceiling height delineates a hallway that flows along the edge of the living and dining areas to the kitchen. Without inserting any walls, the architects have been able to create distinct spaces, each with their own unique features, but unified under a common design. The bedroom exhibits the same spare beauty that we’ve seen elsewhere in the home. Clean-lined modern furniture, wood floors, glass walls—and that amazing view—continue from the public spaces into this private retreat. Earth tones of white, grey, brown, natural wood create warmth, even though the design is simple. The vaulted ceiling that we saw in the main living areas is also a feature in the bedroom. Although here, the vault runs cross-wise rather than lengthwise. 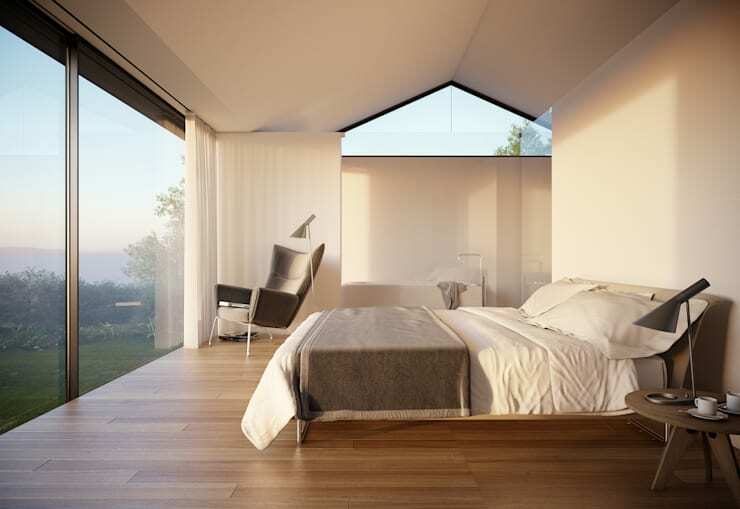 A large triangle window set into the gable provides extra sunlight without compromising privacy. To conclude our tour, we return to the outside. From this view, the house resembles more conventional modern structures. Boxy, right angles, flat roof. However, as we’ve seen, architecture can surprise us. 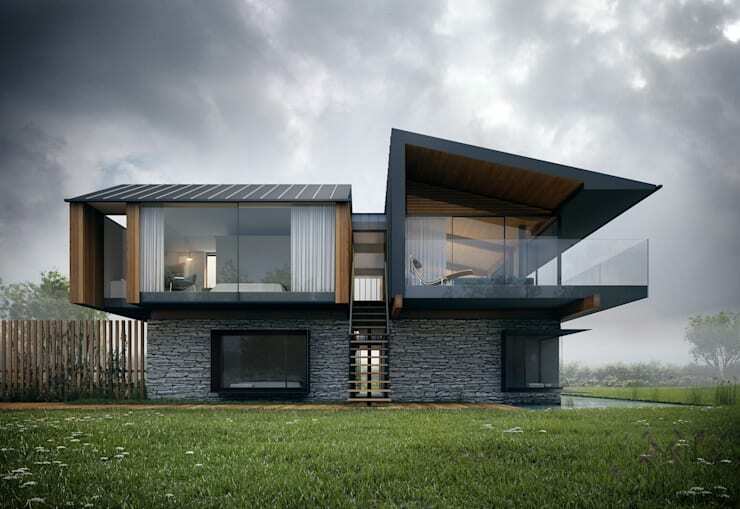 And as we play with our image of what a house can be, we can come up with some absolutely amazing homes.